The buzz over Honda’s new dual-sport hasn’t died down yet, and it’s been six months since the bike was first announced. We’ve been riding the bike since late summer and have learned to love it for what it is. We’ve also learned exactly what it isn’t. Some riders will be delighted with it, others will be disappointed. Which group will you be in? It depends on who you are. As expected, weight is the bike’s biggest downfall. Owners can shave off a few pounds, but it will never be as light as a Husqvarna FE450 or Beta 430RR-S. WHEN IS AN L NOT AN L? Up front, this is nothing like the CRF250L, and we don’t understand why Honda would use such a similar name. That bike was made with a low price as the primary objective; not this one. 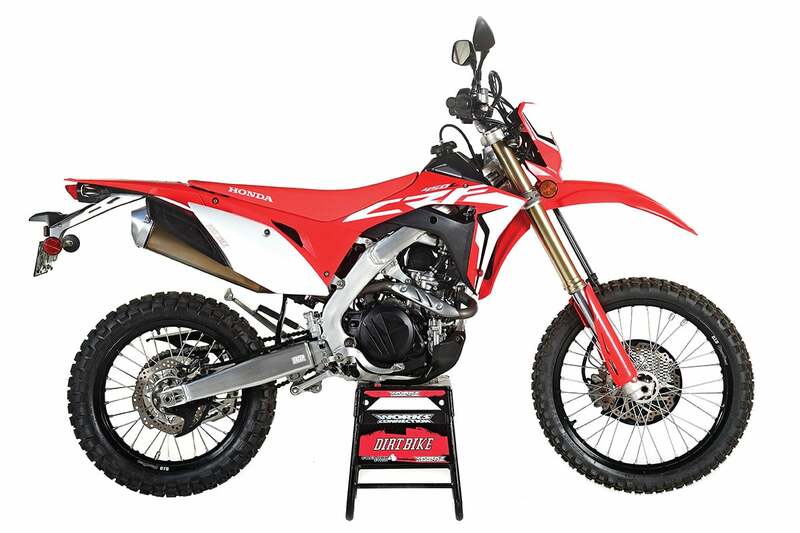 The new 450L is based on the latest version of the Honda CRF450R motocross bike but with full 50-state EPA and DOT approval. That’s a very big deal that held Honda back in the past. The XR650L might not be taken too seriously today, but in 1993 it was as good as a dual-sport bike could be. It has gone unchanged for all these years because it was grandfathered in. It would never pass the EPA’s current emission tests. Getting a modern bike through those tests is phenomenally difficult, and the noise test is even more problematic. Just ask anyone at KTM. For years they flew under the radar because they were considered such a small company. Those days are gone, and getting the current 500EXC to pass took time, testing, patience and money. They proved it could be done, though, so Honda ran out of excuses. In the eyes of the people at Honda, this bike is designed for that same rider. 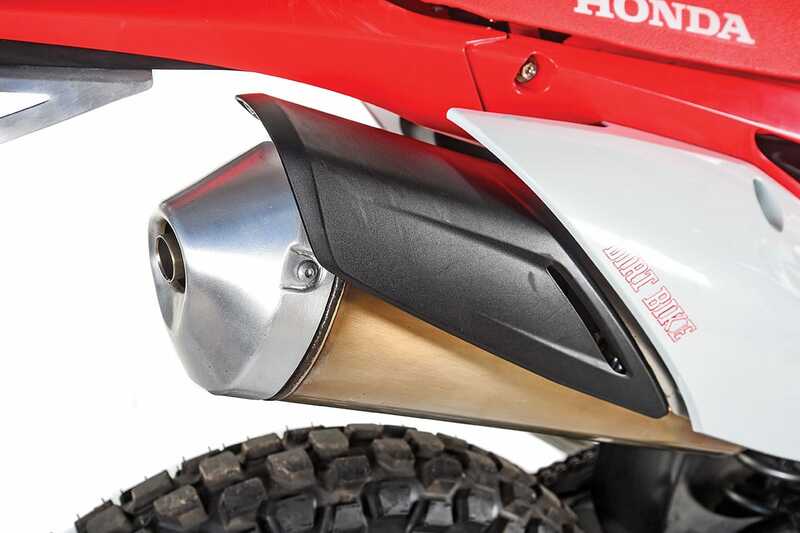 It’s not legal for the end user to modify anything that pertains to the emission equipment on the CRF450L, but that won’t stop many people. The stock muffler will be the first to go, but unless there are mapping changes, the bike probably won’t benefit from it. 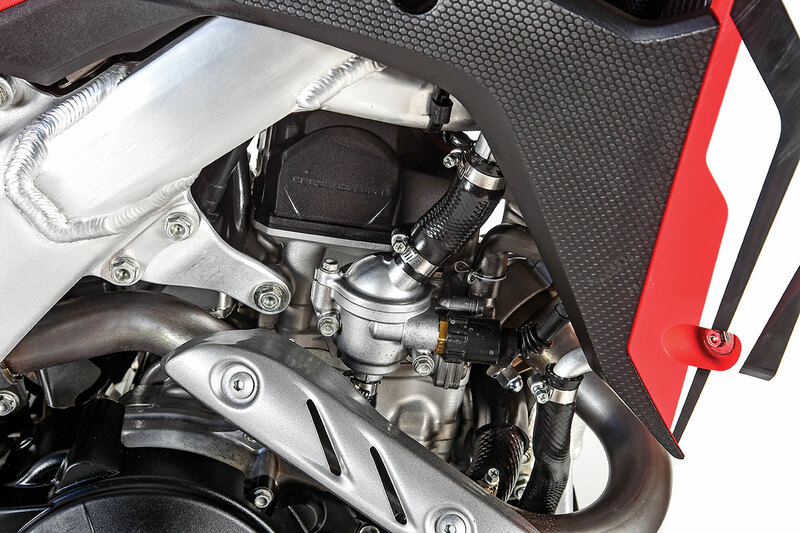 Will you be able to fit the CRF450R’s ECU? No. Everything is different. The L has as much of the motocross bike as possible, but in terms of part numbers, that’s not very much. It uses the same motor layout, but the cases are wider to accommodate a six-speed gearbox and a larger oil capacity. That, in turn, created the need for some slight frame changes, but the geometry and even the suspension components are the same as the 450R’s. The fuel tank is still titanium, but it has a capacity of 2.01 gallons rather than the R’s 1.67. The clutch has a cush drive, and the motor is in a different state of tune. 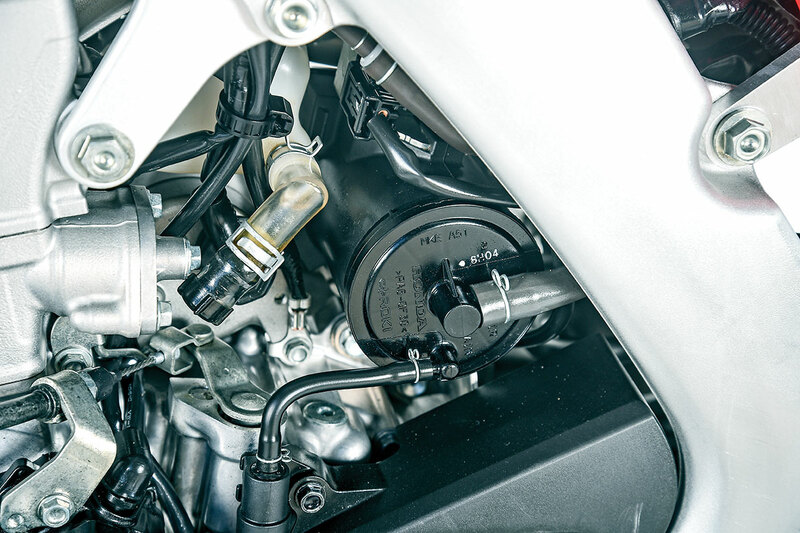 Honda did not resort to the time-honored cheat of selling the bike with a throttle stop that has to be removed after it leaves the dealership. Thank you, Honda. It is perfectly ridable without modification. The rear fender bracing is sturdy enough to use as a grab location. The motor’s ECU is locked, the muffler has a catalyst, and there’s an air-injection pump hanging off the right side of the motor, although it’s at least somewhat smaller than the one on the Honda XR650L.The bike is super quiet, as is required by the EPA. This goes way beyond the big stainless steel muffler. The engine cases even have external plastic guards to reduce mechanical noise. What had us concerned ahead of time was the bike’s claimed weight. The brochure says it’s 289 pounds with a full tank. We will at least mention that Honda has a new policy of honesty in its weight figures. We weigh all test bikes and on our scale, the bike is 277 without fuel. Once you allow for 6 pounds per gallon, Honda’s figures are spot-on. The bike is heavy. Where is the weight? 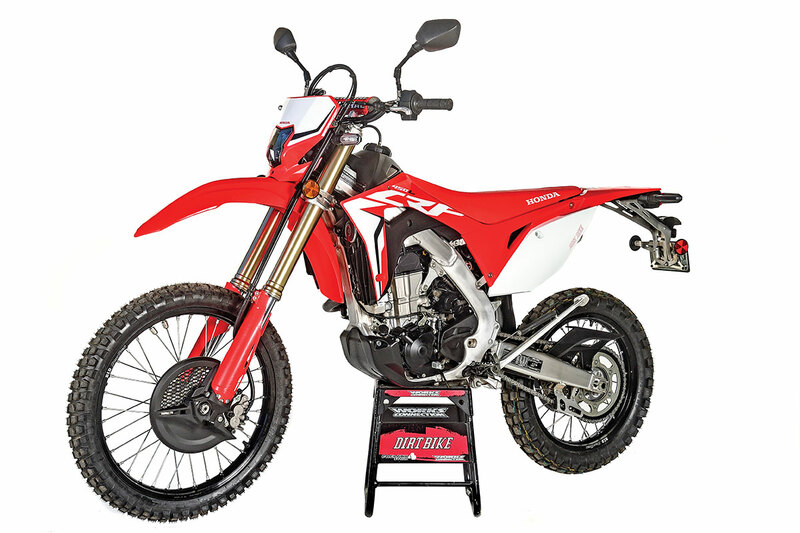 To begin with, the Honda CRF450 motocross bike is already the heaviest of the 450 motocross bikes. The air pump, the muffler and the engine covers only account for much, but more of it is just Honda being Honda. 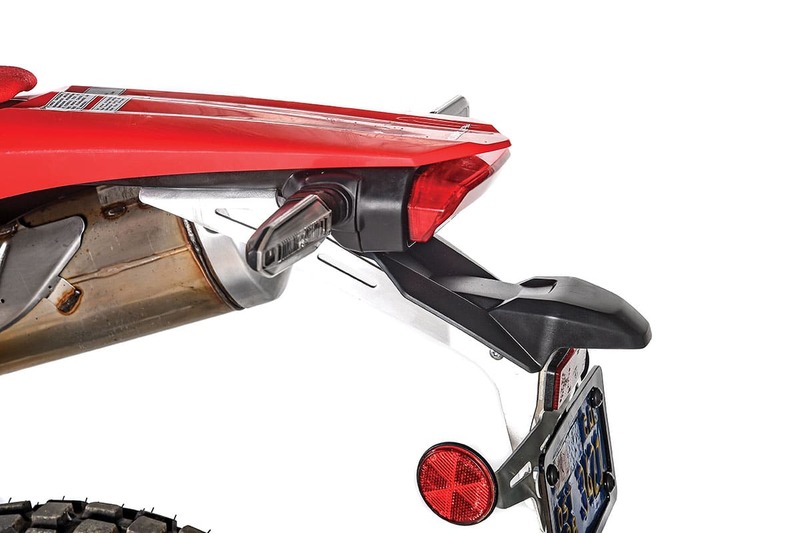 The subframe is so substantial that you can stand on the rear fender. The kickstand can easily support the weight of the bike with a rider standing on the pegs. The mirrors are large and burly. All of those are good things to overbuild, but they add up. Weight is a very big deal in this world, and that alone more or less puts the Honda in a different category from dual-sport bikes that weigh 30 pounds less. It feels heavy. You simply can’t give away that many pounds and have the bike work as well as bikes like the KTM, Husky or Beta. The weight comes into play on steep hills and narrow singletrack, but it’s not something you think about all the time. The bike would be incredible if we didn’t have those other dual-sport bikes as benchmarks. Once you get out of the really tight stuff, you forget about weight. 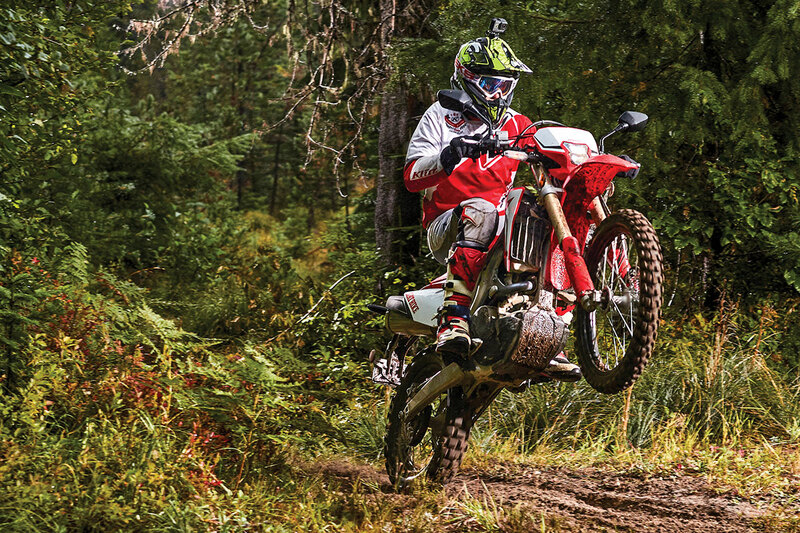 The Honda is a much better bike in third gear than it is in second or first–that is to say, it works best on terrain that would put you in their gear. Above 20 mph and the bike is awesome. It’s the king of fireroads, but it’s not something you would want to ride in a GNCC. In some things, Honda didn’t cut corners. The suspension components are the same as those on the motocross version, but with different settings for off-road. On the other hand, is it too much to ask for handguards? We have ridden the bike with several sets of tires. The bike we rode in Washington had Dunlop D606 full knobbies and currently the bike has Mita DOT Knobbies. The stock IRC tires were chosen for one reason only—noise. 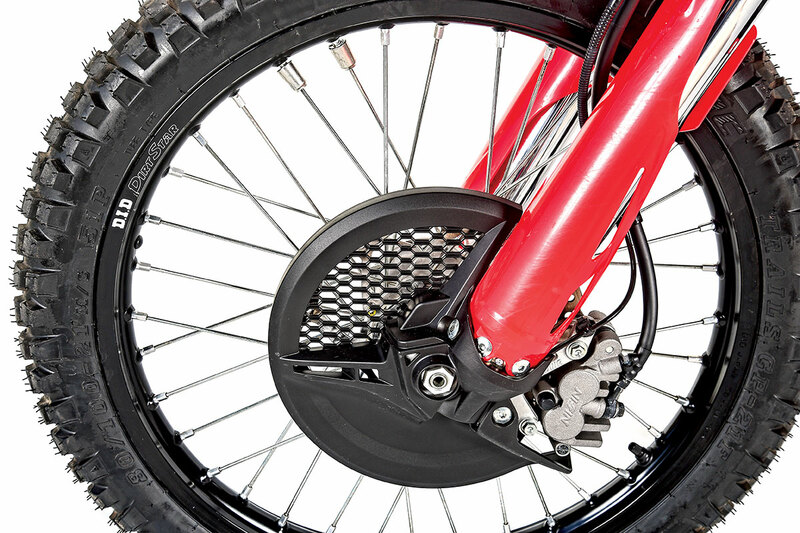 Tires do much to improve the bike’s off-road talents. The attention-grabber is how sweet the motor is. Honda did a spectacular job with the power. The emission restrictions are pretty much invisible. It has deep, rich power on demand. The bike is so quiet that you don’t expect much power, so it can be a little surprising at first. But, you get used to it. The only complaint we have regarding the motor is that it seems very revvy, as if it has very little flywheel effect. It stalls very easily. This doesn’t seems to have anything to do with the EPA. It seems to be more related to the clutch, which is grabby. There are a number of differences between the clutch on this bike and the one on the MX bike, but most are related to cushioning shock to the transmission. When a bike is used on the pavement with perfect traction, the gearbox would suffer if Honda’s hadn’t paid careful attention in this area. Nissin brakes and DID Dirt Star rims are used up front, just like on the MX bike. As far as the gear ratios are concerned, Honda did about perfect. First gear is about perfect for really tight trails, and sixth might seem low after droning for more than an hour on pavement, but that’s how it should be. Someday, someone is going to make a seven-speed. The charcoal canister is well hidden. The CRF450L is not nearly as powerful as a CRF450R motocrosser, in case you have unrealistic expectations. Nothing is. 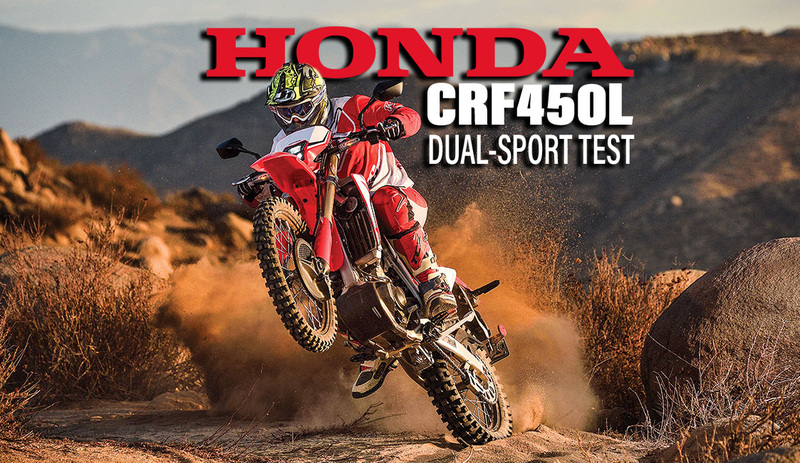 For that matter, the CRF450RX off-road racer and that whole breed of off-road racing bikes are all preposterously over-powered for the trail. Those bikes are for racing, whereas the L has excellent power and a very good delivery for real off-road riding. Is it as fast as a Husky FE450? Yes. It might be stronger. Of all the things that Honda did right, suspension is at the top of the list. The fork and shock are top-shelf units, just like those of the MX bike. The L is softer, as you would expect, but the spring and damping rates are about perfect for the trails of the Pacific Northwest. We tried to bottom the fork on the rare whoop sections and didn’t do it. The rear end can hit bottom, but only when you expect it. Suspension is clearly the bike’s strongest asset. The thermostat and air pump look out of place on the right side of the Honda motor. We’re not sure if that will be enough to carry the bike through comparisons with the Husqvarna FE450, the Beta 430RR or the as-yet-unreleased KTM 450EXC Six Days. The Honda’s weight is a big issue, and the Honda surrenders fuel capacity and equipment like oversize bars and handguards. The price is slightly below those bikes. The Honda sells for $10,399, whereas the Beta is $10,499, and the Husqvarna is $11,099. A full comparison between the Honda, KTM, Husky and Beta is underway right now. Stay tuned. 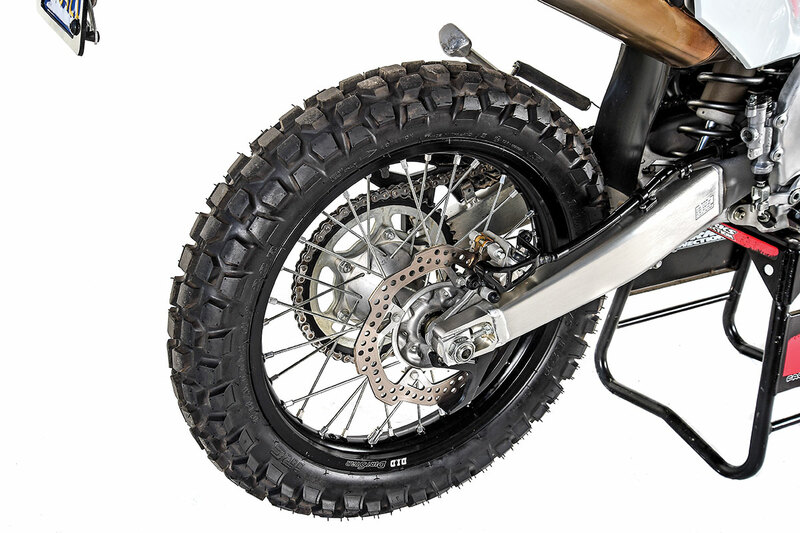 IRC dual-sport tires are heavily street oriented and used mostly to pass sound testing.